The first three of these schemes are used exclusively for sludge dried to over 90%. This restriction is imposed by the nature of the processes and by the latters’ need to benefit from a maximum NCV from the products injected and minimum water vapor in the total flue gases to be treated. Co-incineration with special industrial waste or in an electricity generating station, in France at least, is anecdotal. For instance, processing dried sludge in thermal power stations is currently more prevalent in Germany. With regard to co-incineration in cement works furnaces (several examples in Switzerland), there is a further restriction associated with the impurities contained in mineral matter that can modify the behaviour and the quality of the clinker produced. Within this context, the problems posed by phosphorous are the most important and can, on their own, render this system fragile. To date, the most frequent sludge co-incineration system is the one that consists in co-treating the sludge with household waste in grate incinerators. This co-treatment can be carried out either with dewatered sludge (IC 850 process) or with pre-dried sludge (totally or partially (same NCV as household waste). Household waste incinerators tend to be grate incinerators. Figure 37 shows an IC850 installed on the front of the incinerator. 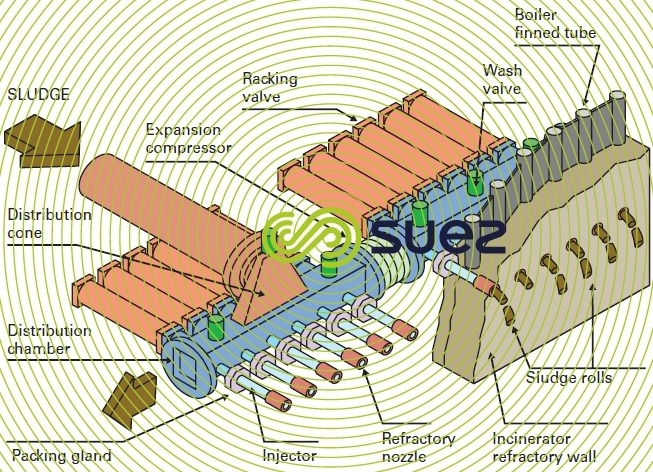 An IC 850 (figure 38) comprises a certain number of injectors that can be used to shake down the waste when actuated by the cylinder rod. Rolls measuring approximately 20 mm in diameter are formed and sheared under the effect of their own weight (in lengths of approximately 10 cm). They drop down on to the incinerator grate, usually at the start of the waste combustion area. allowance to be made for the specific pollutants contributed by the sludge when designing flue gas processing systems, more specifically the S and Hg aspects. As a result, these considerations limit the treated raw sludge tonnage/infed raw waste tonnage ratio to approximately 10-12 %. overall, in terms of direct costs, this is the most cost-effective incineration process on the market. The most frequently encountered case is that of pre-dried sludge having a net calorific value that is the same as that of the waste (partially pre-dried to approximately 65 % dry solids content). The Megève or Limoges (France) plants have been designed for this configuration with sludge that is pre-dried using the Centridry process (see the section sludge drying to an intermediate dry solids content). Particular care must be taken when handling and, if applicable, storing predried sludge because, by virtue of its residual humidity, this sludge is not easily stored and handled after being put into storage. Critical dry solids contents thresholds, specific to each sludge, are compulsory in order to prevent the sludge from solidifying in the storage tank in the case of intermediate storage prior to subsequent injection into waste feed hoppers. On the other hand, when sludge can be poured in bulk into the waste pit, allowance only has to be made for dust in the pit and for ensuring that the load is evenly distributed. 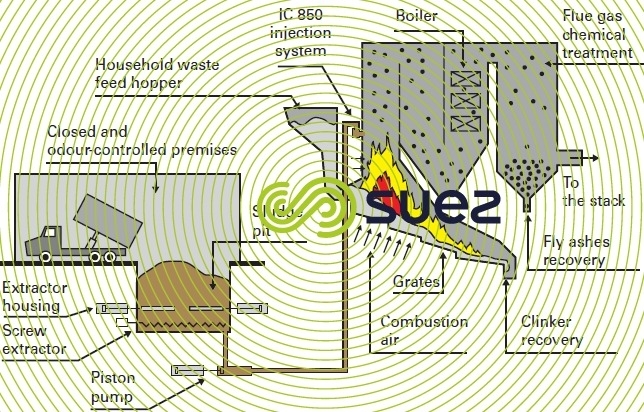 Fully dried sludge that is delivered as pellets or granules can be co-incinerated (e.g. Villefranche-sur-Saône, France) providing that the sludge/waste ratio is adhered to in order to avoid localised vitrification phenomena and adhesion to the refractory walls.